Test anxiety can be a real problem when you are so stressed out over a test that you can’t get past the nervousness to focus on the test questions and do your best work. Take the Test Anxiety Assessment below to find out whether you have a problem with test anxiety. To find out if test anxiety is an issue for you, take the following assessment. Give yourself a 0, 1, or 2 for each of the following questions (no = 0, somewhat = 1, and yes = 2). Do you have a hard time getting started studying for a test? Do you find that many things distract you while studying for a test? Do you expect to do poorly on a test no matter how much or how hard you study? Do you experience physical discomfort while taking a test, such as sweaty palms, upset stomach, a headache, difficulty breathing, heart racing, or muscle tension? Do you find it hard to understand directions and questions on a test? Do you have trouble organizing your thoughts during a test? Do you often draw a blank while taking a test? Do you find your mind wandering to other things during the test? Do you usually score lower on tests than on assignments and papers? Do you remember information after the test is over that you couldn’t remember while taking it? Do you find yourself thinking things like “I can’t do this” or “I’m so stupid” while taking a test? Do you feel like the room is closing in on you during a test? 0-5 You don’t have much difficulty with test anxiety. 6-12 You have some test anxiety, and it would probably be helpful to learn some techniques. 13-19 You have significant problems with test anxiety — definitely learn some techniques. 20-24 You have severe test anxiety — get some help right away! Use a little stress to your advantage. Stress is your body’s warning mechanism — it’s a signal that helps you prepare for something important that’s about to happen. So use it to your advantage. Instead of reacting to the stress by dreading, complaining, or fretting about the test, take an active approach. Let stress remind you to study well in advance of a test. Chances are, you’ll keep your stress from spinning out of control. After all, nobody ever feels stressed out by thoughts that they might do well on a test. Get help. Although a little anxiety can be a good thing, an overdose of it is another story entirely. If sitting down to a test gets you so stressed out that your mind goes blank and causes you to miss answers that you know, then your level of test anxiety probably needs some attention. Ask your professor, friends, or parents for advice or check the Internet for suggestions. There are also a number of books published on this subject. 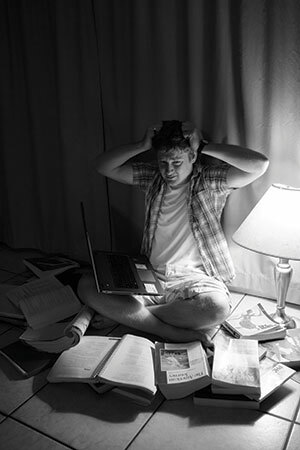 If you have extreme test anxiety, see the Health & Wellness Center for help. Be prepared. Some students think that going to class is all it should take to learn and do well on tests. But there’s much more to learning than just hoping to soak everything up while sitting in class. That’s why good study habits and skills are so important — and why no amount of cramming or studying the night before a test can take the place of the deeper level of learning that happens over time with regular studying. Many students find that their test anxiety is greatly reduced when they start to study more effectively and/or more regularly. It makes sense — the more you understand the material and gain more than a passing familiarity to it, the more confident you’ll feel. Having confidence going into a test means you expect to do well. When you expect to do well, you’ll be able to relax into a test after the normal first-moment jitters pass. Watch what you’re thinking. If expecting to do well on a test can help you relax, what about when you don’t expect to do well? Watch out for any negative messages you might be sending yourself about the test. They can contribute to your anxiety. Accept mistakes. Another thing you can do is to learn to keep mistakes in perspective — especially if you’re a perfectionist or you tend to be hard on yourself. Everyone makes mistakes, and you may have even heard teachers or coaches refer to mistakes as learning opportunities. Learning to tolerate small failures and mistakes — like that one problem you got wrong in the math pop quiz — is a skill you’ll use for the rest of your life. Learn relaxation techniques. It can help to learn ways to calm yourself down and get centered when you’re tense or anxious. For some people, this might mean learning a simple breathing exercise. Practicing breathing exercises regularly (when you’re not stressed out) helps your body see these exercises as a signal to relax. See the section on Dealing with Stress for more details. Take care of yourself. Taking care of your health will help with test anxiety (as with many other things). Getting enough sleep, exercising, and eating healthy food before a test can help keep your mind working at its best.